How Do Elections Impact your Portfolio? We’ve been fielding occasional questions from clients about how to invest given the upcoming election. So, we thought it might be helpful to provide some insight into the historical impact elections and presidents have had on the market. The day after the first round of presidential debates, we came across an article outlining the words most frequently spoken by each candidate. To help illustrate this concept, they included a word cloud, which forms the words in a cluster and uses different font sizes to show the prominence of each term. It’s an easy way to quickly see where the candidates chose to focus their remarks. 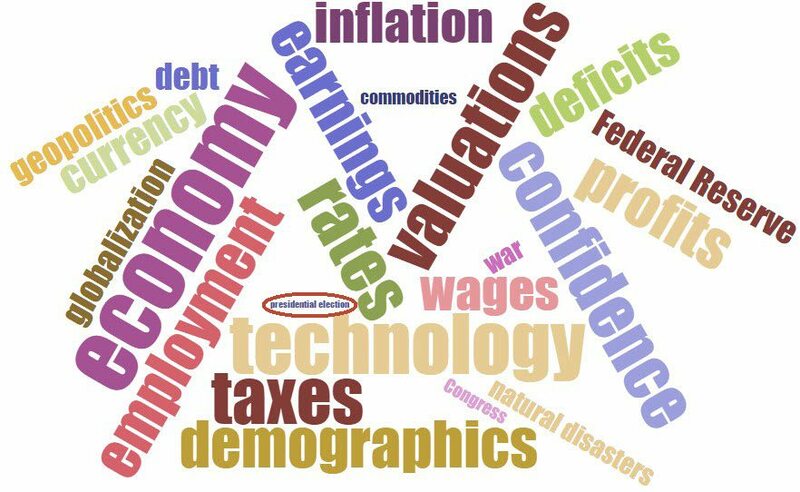 If we apply this same word-cloud framework to the factors that drive market returns over time, we see that elections and presidents do have some impact on how markets perform. However, there are other more significant factors that we believe the market generally pays attention to more. Consider the simple example below. Over the long term, the market tends to focus on things like valuations, earnings, investor confidence, and general health of the economy over more headline-driven stories like elections and the party in control of the White House. If you’re having a hard time seeing “presidential election” (circled in red), it’s for good reason – it’s purposely made small to show the appropriate comparison of that event to other more prominent factors. Keeping that in mind, let’s then address how presidential elections historically affect market performance. We generally expect to see some increased stock market volatility leading up to and immediately following the election. Markets hate uncertainty, and presidential elections bring quite a bit of uncertainty to the mix. This tends to be a short-term effect, though, as volatility historically fades after investors digest the news. Beyond this, we believe the impact of the election is fairly minimal as it relates to most investors. Our fund partners at Vanguard recently put together a study of stock market returns based on the party in control of the White House. From 1853–2015, the average annual returns were virtually identical for both parties, coming in around 11 percent. This 160+ years of data tells us that the market is basically indifferent when it comes to who is in office. In reality, the president has limited control over the direction of the U.S. economy or financial markets. Political agenda helps steer the focus of legislators, but policy recommendations can only go so far. If we look at specific examples throughout history, we can see this play out. Out of the last 10 U.S. presidents, the market had the best performance under Gerald Ford. Is this because he was the best president over the last 50 years? We believe this phenomenon is more likely the result of stocks being attractively priced following the bear market that ended shortly after President Ford took office. Correlation does not necessarily imply causation. While the election makes for some great headlines and drama, we urge you to resist the temptation to do anything based on fear or speculation of what might happen leading up to or following the election. Most investors will have funding goals that span years or even decades beyond Election Day, so we recommend maintaining that long-term focus in order to give your retirement plan the best odds for success. If you have questions or need help putting together a plan that can help you reach your long-term goals, please do not hesitate to let us know!